PlayAmo casino is hosting its next weekly tournament right now, featuring a grand prize of €1000 – that will be going to the winners at the end of this week. Grab yourselves some extra cash at casino PlayAmo on a weekly basis, which is mainly thanks to the various tournaments like this – bringing forth some amazing table games, which are a classic staple of the gambling entertainment. Take part in the next part of the race and win a cash prize in no time, which you can immediately achieve by signing up with Play Amo. The leaderboard is based on total scores gathered throughout the duration of this tournament, and the players can collect 1 point for every total bet worth €1. Of course, only bets made on the table games will count toward the leader board, plus there are certain restrictions, like the minimum risk wagering – which is prohibited from use. All tournament prizes are subject to a mandatory wagering requirement: x3, which has to be met in full before a withdrawal can be requested. This however, would work toward the advantage of ensuring that everyone could become eligible for a cash prize like this. 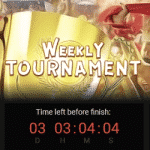 It's currently the 12 round of the races, so make sure that you join the tournament in the following days, because the current stage is going to conclude on the next weekend.